I have always had a dog. Rusty, Te’, Gypsy, Misha, Deidra, and after our son Aaron was born, Obie (as in Obie-Wan Kenobi). After we lost Aaron our only child, we found ourselves alone in our house for the past 3 years. We’ve toyed with the idea of another dog but each time we considered, up came another excuse. Stories of how lonely senior citizens “awake” upon receiving a pet were not new to us. Nor were the stories of the therapeutic power of a pet on terminally ill patients. When my wife came home telling me some friends of ours were about to take ownership of a new puppy, along with the website of the breeders, I thought I would give a look. That’s all it took. Once I saw the picture of the plump little puppy carrying the pine cone I knew it was time to make a phone call. So up we trotted into the mountains where we lay dibs on that fat little puppy and a couple of days later we brought Tess, the 8 week old, overweight, pine cone clutching Jack Russell Terrier home. 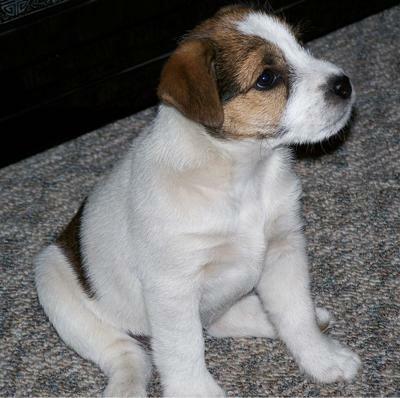 Now my knowledge of Jack Russell’s were no more than knowing about that cute little dog on Frazier, no more, no less. At 57 years old I figured I could certainly handle a puppy! As my wife says, “Somebody ought to 'V8' me to the forehead.” Tess is a real live running, jumping, biting, pooping, peeing ball of energy. AND WE LOVE HER! Now I’m not so delusional to think for an instant that this furry little creature would or could ever take the place of Aaron; not ever, and his loss hurts almost as much today as the day he died. However, Tess has brought an energy, spirit and love that has eluded our house since Aaron’s passing. The fact that we now have something quite more than our grief to pay attention to, something to occupy our time rather than TV and silence, something that demands our love and attention (and liver treats) has become a blessing that has put years back into this old body and our silent house. The fun she has brought us as we train her and teach her tricks, and she can do tricks, is almost as fun as the peace and comfort she brings as she nuzzles next to us on the sofa and falls asleep. What a beautiful little animal. She too is one of Gods creatures surely brought to us when we needed comfort that we didn’t even know we needed. As we begin the fourth year without our son, each day seems a little easier to get through because of this bundle of fur. For this we are grateful.